From the founder of EWTN Global Catholic Network comes this profoundly practical, humorous, and common-sense approach to answering life’s most vexing questions. 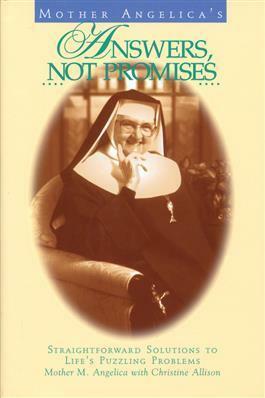 Mother Angelica gently confronts your real-life struggles, lifting your heart to God and leading your soul to heaven as she provides answers from a life dedicated to God – not the promises of a world entrenched in vice. Mother Angelica will become your trusted companion in the battle for virtue as you read through her advice and answer her call to grow closer to Christ. She’ll help you conquer your most deeply rooted sins, and she’ll lead you to overcome the fear of death, the pain of guilt, and the seemingly benign attachments you have to the things of this world.